More and more animals are being found dead as the mysterious spate of mass bird and fish deaths has turned into a global phenomenon. The latest two separate incidents saw thousands of fish found floating in a creek in Florida and 200 birds found dead on a highway bridge in Texas. 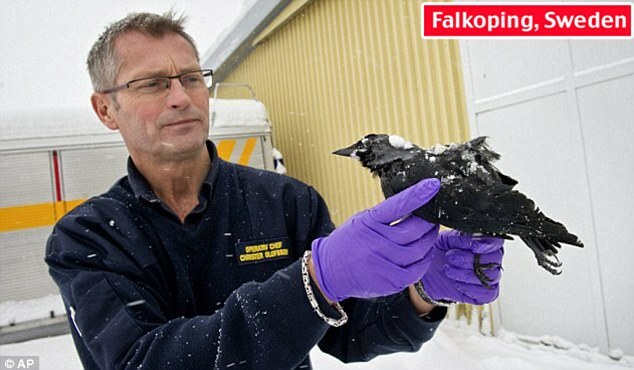 Experts were yesterday carrying out tests on around 50 jackdaws found dead in a street in Falkoping, Sweden, that appear to have suffered the same fate as thousands of their cousins who fell from the sky in separate incidents in the U.S.
Swedish experts have said the shock of fireworks being let off near the city, in the south-east of the country, and difficulty finding food may have led to the deaths of the jackdaws. 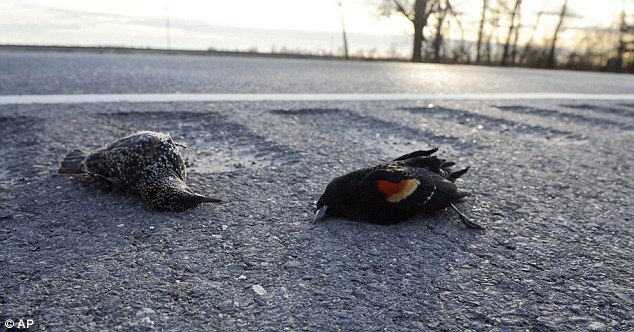 Many of the birds are believed to have died from stress or as a result of being run over by vehicles while disoriented. 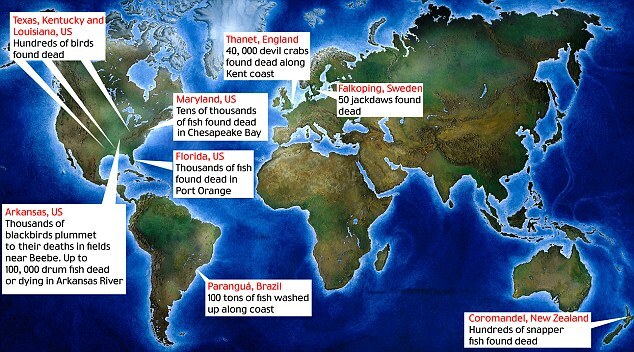 And scientists have also been left baffled by at least 100 tons of sardines, croaker and catfish washing up dead along the Brazil coastline near Paranaguá. 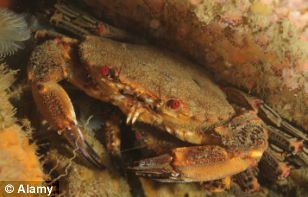 There were more fish deaths reported today in New Zealand, while in England, the carcasses of 40,000 devil crabs are strewn across a beach in Kent. Hundreds of dead starlings and robins were found scattered in backyards in the Kentucky town of Gilbertsville while an estimated two million dead fish have washed ashore in Chesapeake Bay, Maryland. They are the latest in a spate of incidents which are being blamed on New Year fireworks, thunderstorms, cold weather, parasites and even poisoning. The internet has been abuzz with conspiracy theories about secret government experiments being behind the deaths, or it being a sign of a looming Armageddon at the end of the Mayan calendar next year. Tests are being carried out on the dead animals, but results are not expected for several weeks. 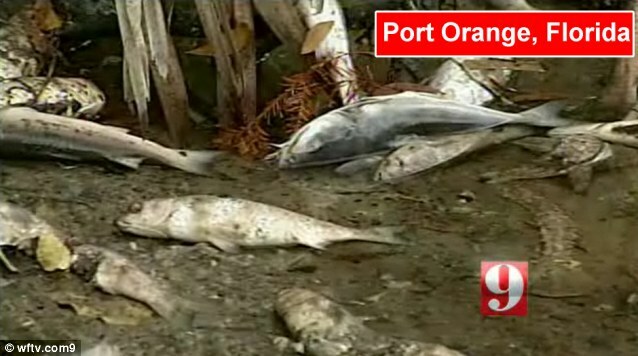 Thousands of Brazilian fishermen are struggling to make ends meet after the sale of seafood was temporarily suspended when masses of fish were discovered dead in Paranaguá, Antonina and Guaraqueçaba Pontal do Paraná. Experts have speculated that cold weather or chemical leaks could be behind the deaths. Edmir Manoel Ferreira, president of the Federation of Fishermen’s Colony of Parana, said the deaths had been discovered since Thursday last week. ‘On Thursday we began to find a lot of dead fish. One community had to bury 15 tons alone. Samples of the dead fish have been sent to the Centre for Marine Studies at the Universidade Federal do Parana. One of the latest incidents saw thousands of fish found rotting and floating in Spruce Creek, Florida, after a period of cold weather. Mullet, ladyfish and catfish have been washing up as winds cause the carcasses to gather on bends along the creek. And 200 birds were found dead on a highway bridge crossing Lake O’ the Pines in Big Cypress Creek, Texas. 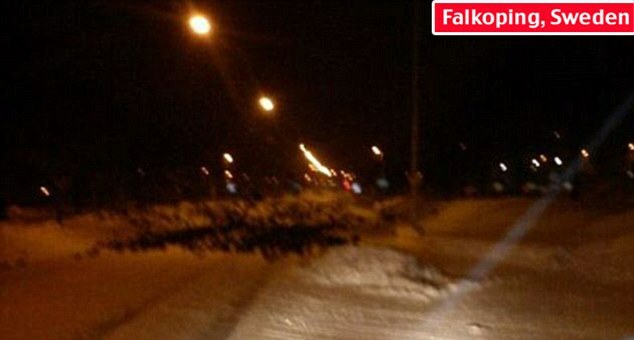 Experts believed the birds had been hit by passing vehicles while walking or apparently trying to roost on the bridge. 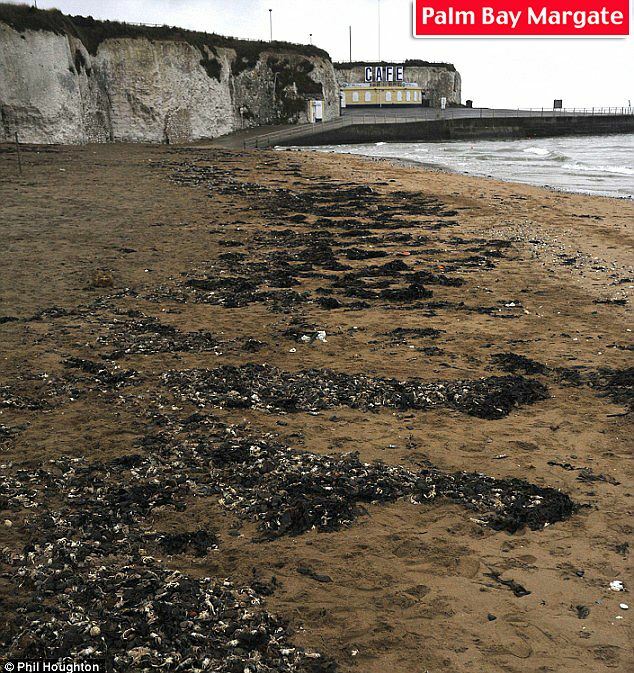 The cold weather in Britain has also been blamed for the deaths of 40,000 Velvet swimming crabs – also known as ‘devil’ crabs – found littering beaches in Thanet. Last year, the Environment Agency set up an inquiry into unexplained numbers of deaths amid fears a mystery virus could be to blame. But it concluded the crab deaths were linked to the cold weather. Tony Childs, Thanet Coast Project Manager, said: ‘We had a crash in numbers last year and we hadn’t expected such a large population. ‘As happens with the circle of life in nature, we expect the crabs to be naturally dispersed from our shores very quickly by our local seagulls. Scientists blamed fireworks for confusing blackbirds in Beebe, Arkansas, with then crashed into homes, cars and each other as people celebrated the New Year. 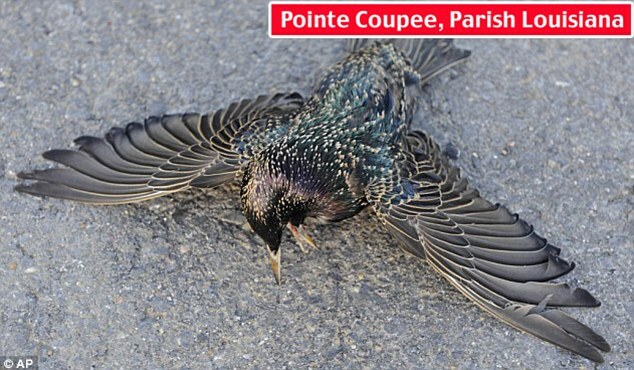 Another 450 birds were also found dead along a highway in Baton Rouge, Louisiana. They are believed to have hit power lines after becoming disoriented. 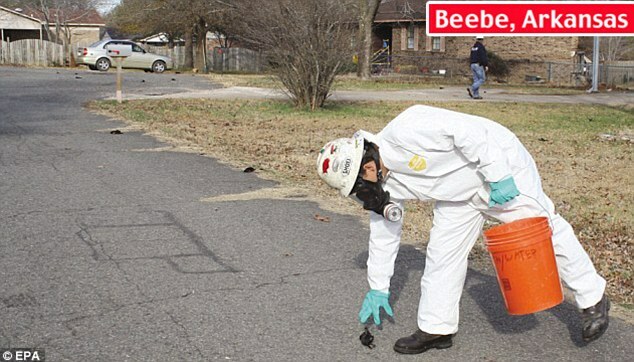 Fifty of the creatures were found near a power line 30ft from Louisiana Highway 1. A second group was discovered stretched from the power line across the highway just a quarter of a mile away. Dan Cristol, a biology professor and co-founder of the Institute for Integrative Bird Behavior Studies, said the Louisiana birds may have been ill or startled from their roost before hitting the power line. ‘They don’t hit a power line for no reason,’ he said. 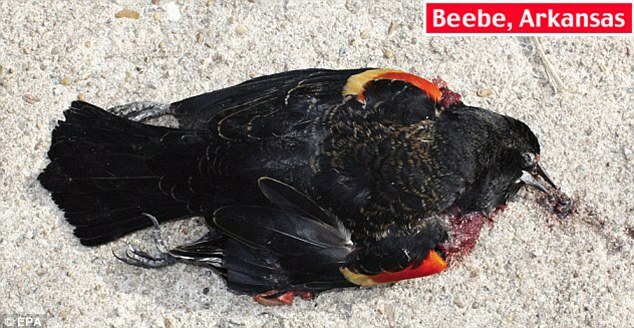 New Year’s revellers spent the holiday weekend cleaning up dead red-winged blackbirds in Beebe. Some blamed the bad weather, while others said one confused bird could have led the group into a fatal plunge. Experts in Beebe said fireworks may have caused frightened birds to fly lower than normal, where they crashed into homes and other objects. Karen Rowe, an ornithologist with the Arkansas Game and Fish Commission, said: ‘The blackbirds were flying at rooftop level instead of treetop level. Wildlife officials in both Arkansas and Louisiana have sent the carcasses to researchers at the National Wildlife Health Center in Madison, Wisconsin, and the University of Georgia. 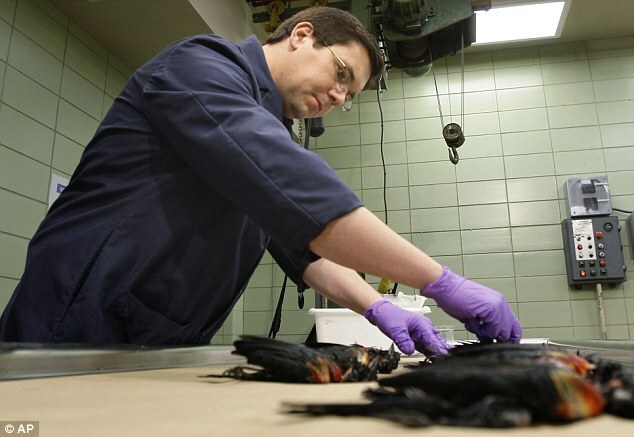 In 1999, several thousand grackle birds fell from the sky and staggered around before dying in north Louisiana. It took five months to get the diagnosis – an E. coli infection of the air sacs in their skulls. 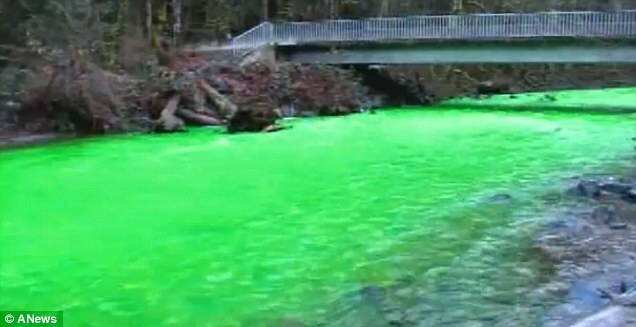 It comes after 100,000 drum fish were discovered in the Arkansas River, just 100 miles from Beebe. Officials said the deaths were not related to the birds, and they had likely been affected by illness as it was one species. They blame the deaths – affecting menhaden, spots and croakers – on the stress of cold water. 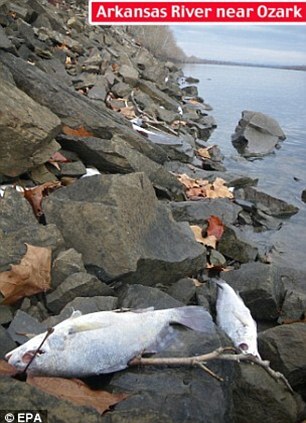 Tens of thousands of small fish have also been discovered dead in Chesapeake Bay, Maryland. Another explanation was that violent thunderstorms may have disoriented the flock. Red-winged blackbirds are among North America’s most abundant birds, with somewhere between 100million and 200million nationwide, according to the Cornell Lab of Ornithology in Ithaca, New York. A few grackles and a couple of starlings were also among the dead. Those species roost with blackbirds, particularly in winter.